The cemetery, open to all, offers multiple choices and options. Expansion of the 112-year-old cemetery at The Church of the Annunciation, 7580 Clinton St., Elma, is currently under way. The plan, according to parish officials, is to offer a more sacred space in a parklike setting. The cemetery, open to all, offers multiple choices and options. There are in-ground burial spaces in single, companion or family plots for full body burial or cremated remains. 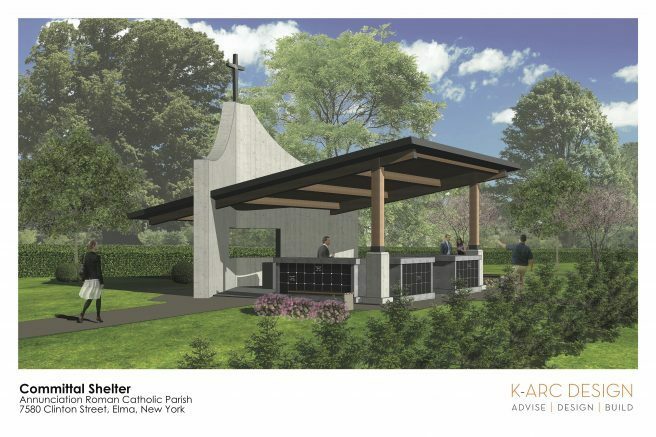 The centerpiece of the cemetery expansion is the new Resurrection Committal Chapel that houses four free-standing columbarium. Each columbarium has niches for the burial of cremated remains with each niche accommodating two sets of cremains. The Resurrection Chapel will have an altar for outdoor services and where Burial Rites of Committal will be celebrated. The Church of the Annunciation Cemetery is not limited to Annunciation parishioners. The cemetery is a consecrated Roman Catholic sacred space open to all desiring a quiet place to rest. Pre-construction, veteran/first responder, active ministry and multiple-unit discounts are available. Please call the Parish Office at 683-5254 to schedule an appointment or for more information. Be the first to comment on "Church of the Annunciation begins expansion of historic cemetery"